Callow was speaking at the inaugural Amateur Theatre Fest organised by Nick Hern Books. He was on the bill with an array of practitioners and playwrights including Amanda Whittington, Mike Bartlett and Jez Butterworth who had all pitched up to talk about their work and be quizzed by the audience. That line-up was a reminder of just how important the amateur market is to contemporary playwrights as well as publishers. Unless they have a small cast and have been a megahit – such as Yasmina Reza’s Art, which seems to tour eternally like some dramatic and more profitable version of the Flying Dutchman – new plays are seldom revived widely in the professional theatre. Amateur revivals can really help playwrights’ bank balances. Many amateur groups stage more productions a year than professional theatres, and their tastes can be pretty radical. Time Out theatre editor and contributor to The Stage Andrzej Lukowski discovered this a couple of years ago when he visited his local amdram theatre in Beckenham to watch a revival of Lucy Prebble’s The Effect. 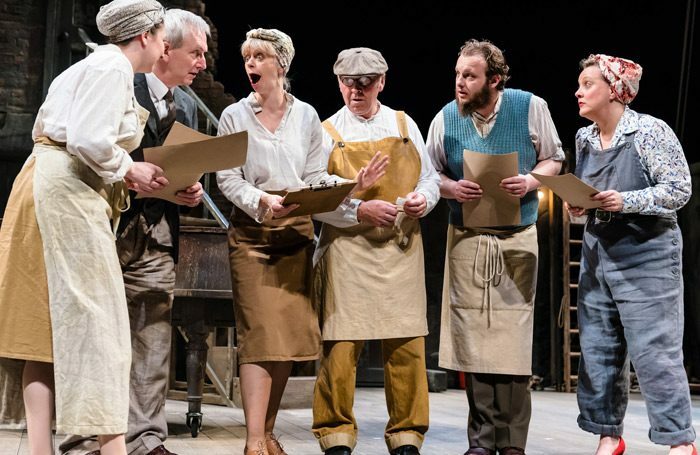 Amateur theatres are doing as much for new writing as the professionals who originally nurtured the work, by getting it to a much wider audience than the few who might see it at a London new-writing house such as the Royal Court Upstairs. Bartlett spoke of his dream to write a play specifically for amateur groups up and down the country, saying it could have the same reach as his current BBC1 series Press. Amateur stagings can be imaginative too. I’d like to have seen the amateur production of Ruth Ellis’ excellent The Thrill of Love, in which clownish whiteface was used in key scenes, as author Amanda Whittington described. There is clearly also nothing amateur about the set-up at the Questors, which stages about 20 productions a year, and boasts a fully equipped main house, a studio theatre, cafe and bar. Yet as Callow pointed out during an entertaining run through his own early professional failings (including an unfortunate incident involving a trap while playing Mr Fezziwig in A Christmas Carol at the Theatre Royal Lincoln during his first season in rep), the professional theatre rather enjoys sending up the amateurs, and ‘amateur’ is often used as a term of abuse. That’s not to dismiss the skill, or commitment of those working in professional theatre, or what Callow described as the willingness “to endure unspeakable humiliation and poverty”. But it also reminds me of the value of doing something for the sheer love of art. It’s a love manifested in drama groups and orchestras across the country who, through their activities in the UK, generate millions of pounds a year through ticket sales, local sponsorship and fundraising. What’s more, these amateur theatremakers are often the most avid theatregoers, regularly paying to see work created by professionals. That is not always true for those working in professional theatre, many of whom see shows their friends are involved in, but otherwise view going to the theatre as a busman’s holiday. Professional theatre would suffer without the amateurs, who grasp that making theatre themselves, and watching the professionals perform, are intimately connected: one adds to the appreciation of the other. There is a well-trodden pathway from the amateur sector into the professional theatre. But as I discovered chatting to people last Saturday, most are not frustrated professionals but are quite content to enjoy it as a hobby rather than trying to earn a living from it. It would be a mistake to dismiss amateurs as less talented than their professional counterparts whether directing, acting, designing or stage-managing, although some may be less technically accomplished and less practised. With a directing workshop from Stephen Unwin, another on performing Shakespeare led by Oliver Ford Davies, and others on stage combat, voice, producing and auditioning, the Amateur Theatre Fest was a rare and welcome occasion when the amateur and professional sectors came together in one space. Stronger links can only be of benefit to both.